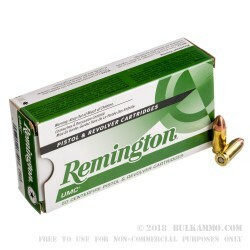 Remington UMC 9x19 ammo is one of the market leaders with regards to budget ammunition. The Union Metallic Cartridge Company has been making and selling ammo for over 150 years and is still going strong. Based out of Arkansas, Union Metallic Cartridge Company has always been firmly based in the USA and produces all its products here. Likewise, the 9mm Luger, also known as the 9mm Parabellum, 9x19mm, or 9mm NATO, has been on the scene for over 100 years and is still used today all over the world. The 9mm was designed and put into service by Georg Luger for his German Luger Service Pistol. Though it was first used by the German Military in their handguns, the 9mm Luger is statistically recognized as the most popular handgun and submachine gun cartridge in the world. The revolver used to be more popular than the automatic handgun, until the 9mm Luger hit the scene and that all changed. 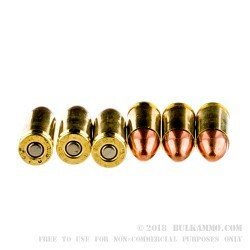 Today, it is still popular and the Union Metallic Cartridge 9mm's are a great example of this. 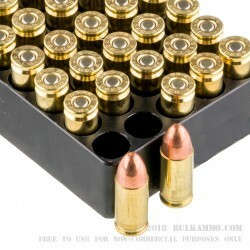 Their 124 grain 9mm full metal jacket, metal-case rounds are a solid value. These loads have brand new, highly polished, Boxer primed, non-corrosive, rimless Brass cases. They push a muzzle velocity of 1110 feet per second, and strike with a 339-foot pound of muzzle energy. Whether you’re planning to go out to the range and do some plinking, or you're headed to a 3-gun or IDPA pistol competition, or maybe you just want to stock your ammo lockers with more 9mm. 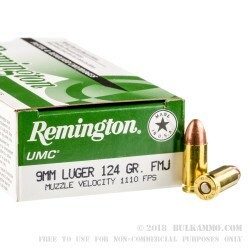 Whatever the case may be, these classic Remington/UMC 50 round boxes of 9mm Luger cartridges will perform for you time and time again. Stock up on these incredible values today.